This summer I found myself invited to one of my daughters friends wedding. I supposed this will be the first in a long line on her friends moving into the matrimonial world. It’s hard to believe that these kids are even old enough to even think about getting into such a commitment. It was only a few years ago we were purchasing graduation dress for them. Now my dilemma was what do I have in my stash that would work for a wedding quilt. Roses….. sure why not. Uhmm… what pattern do I use , something easy that I can add my own twist to.. Walk About its simple ok. I have a plan. What am I going to do to make this an original? Well these kids will need a ton of advise to help them have a successful marriage. OK to tips on what to do… How do I put these in the quilt? I can applique the words, but lucky me I have a friend who volunteered to embroider my words onto fabric for me. Perfect this is all coming together. Make Time For One Another. All I had left to decide is what shape the words of advise be… well its a wedding quilt so why not Hearts. As it turned out the bridesmaid colors were the exact shade of this purple what a coincidence. I didn’t even plan that part. I also wanted the quilting to have meaning so…The quilting around the middle heart is quilted with pebbles as a reminder that marriage can get rocky so refer to the tips. 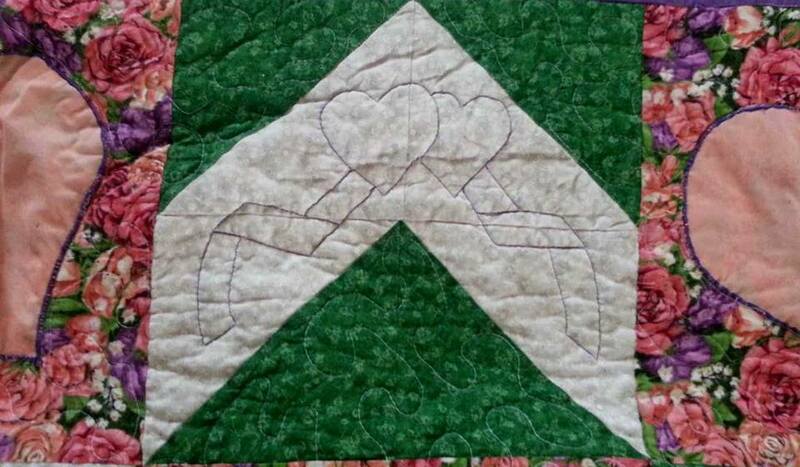 The white is quilted with 2 hearts with ribbon as a reminder that they are forever tied in marriage. The rest is quilted with stippling referring to knowmater how you have planed your life it will wander in many different directions and throw curves at ya. This is the quilt that I Gave them to start their life…. It was well received and the brides parents totally agreed with the meaning of the quilt. They actually told the kids to read it each day. Next Ambitious paper piece project for 2nd round. What a wonderful gift. Love it.